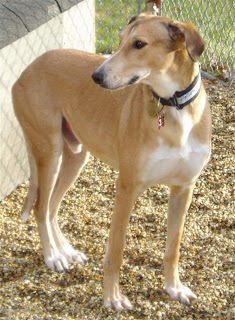 Teddy is the first Greyhound to come to the shelter to find a home. Well, he's actually a Greyhound mix, but he came to us from Greyhound Friends, who rescued him back in April when he was an emaciated, sickly guy in dire circumstances. They got him nice and healthy, but he was overlooked by adopters because he was a mix and they always have so many Greyhounds looking for homes. We are hopeful Teddy will find a home for the holidays, and in the meantime our faithful dog-walking volunteers are lining up to walk him. Matching Challlenge Fundraiser is back!